This article is a step by step breakdown on how to set up Security Deposits and its settings. The system allows for as many security deposits as you would need to suit your company. Where can I find this page? This page is located under the Car Rental category in the settings, highlighted in dark blue in the picture below. How to add a Security Deposit Rule? Firstly, click the blue “Add Rule” button located on the top right of the screen, highlighted in orange in the picture below. Once you click on the button, a new page will appear. Here, fill in all the necessary details. The system is very flexible that it can create different security deposits for different brands you own or different vehicle classes. Click on the blue “Save” button, highlighted in orange in the picture below, to save the deposit. How to delete a Security Deposit rule? Firstly, click the particular Security Deposit rule that you would like to delete. Next, click the red “Delete” button located on the top right of the page, highlighted in orange in the picture below. How to add a security deposit payment into the system? Firstly, navigate to Step 6 (Payment) of the reservation process. In that step, click on the blue “Add Offline Payment” button highlighted in orange in the picture below. Once you have clicked the button, a new window will appear. In this window, select “Authorization” under Payment Type highlighted in orange in the picture below. 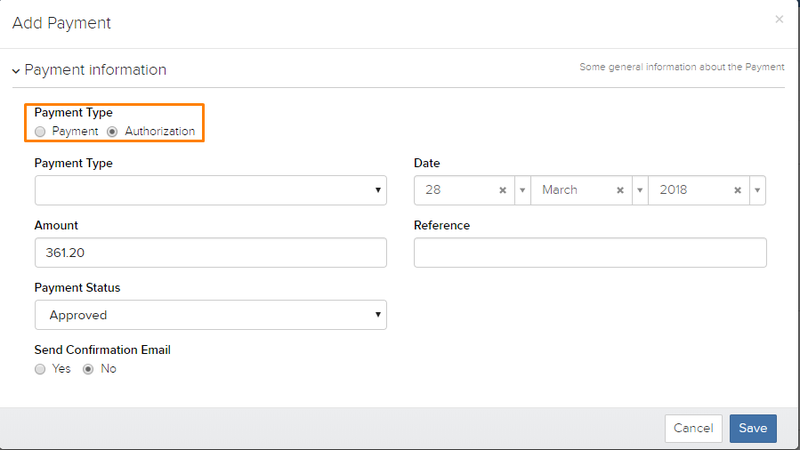 After you have selected the “Authorization” type, add in the payment type and the details of the payment. Next, click on the blue “Save” button. If you would like your customer to pay the security deposit online, select the green “Request Authorization” button highlighted in orange in the picture below. Once you have clicked on the button, a new window will appear. Here it will automatically key in the email address that the customer has entered in step 4 as shown in the picture below. Select the due date and click on the blue “Send Request” button. The system would send an email to the customer with a payment button that the customer can pay online using the payment gateway that you have integrated with the system. You can always send these requests at any time. How can I reduce or remove the security deposit if my customer selects a “Full Insurance” additional charge? Firstly, create the additional charge that your customer will need to select. You can learn how to create an additional charge so by clicking this link here. Next, create a new security deposit with the amount of what you would like to charge your customers and these settings in the picture below. You will notice that we have selected the additional charge “Full Coverage Plan”. This will be the additional charge that you have created. If you want to use this security for a specific vehicle class, you can set it with the vehicle class. Click on the blue “Save” button once you are done. Firstly, navigate to Settings > Car Rental as shown in the picture highlighted in dark blue. Next, navigate to the “Security Deposit” section as shown in the picture below. Here, you can adjust some settings for security deposits. This setting will mean that you can manually select the security deposit that you would like to use for the customer. This setting will make sure that the customer pays for the security deposit first before they pick up the car. 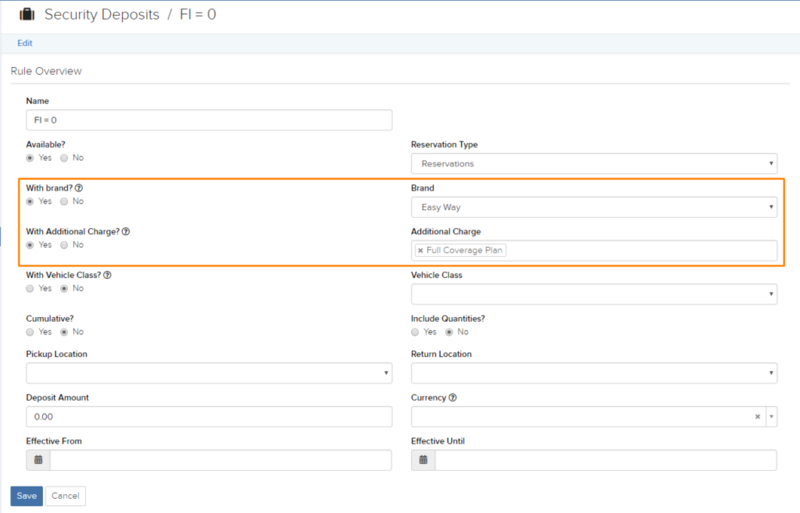 This setting will make sure that the system will always show the security deposit in the reservation summary. This setting will allow your customers to pay for the security deposit in different currencies that you have in the system. To learn more about supported currencies, click here. 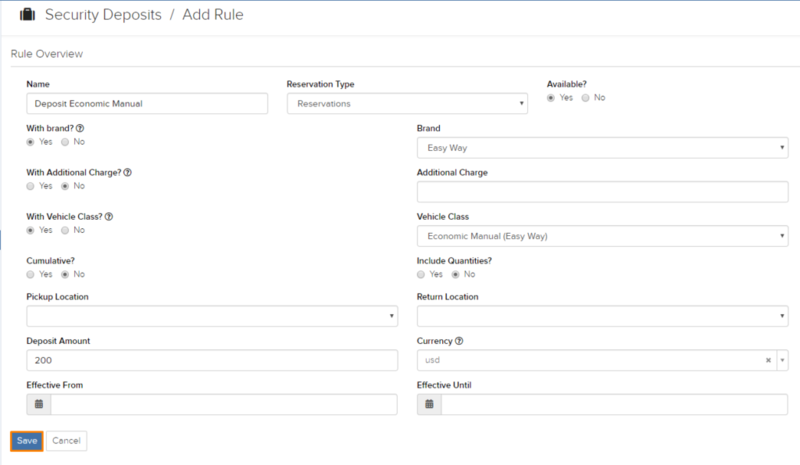 This setting will allow the system to close/complete bookings that have a pending refund of the security deposit. To learn more about the reservation process click here. This setting will show a message on the reservation summary as a reminder for the customer to pay the security deposit. This setting will allow you to select which steps of the reservation summary you would want to the security deposit to show. This setting will remind your staff that they will have to refund the security deposit to the customer. To learn more about refunds, follow this link here. For information about payments, and how to add them to the system click here. For security deposit refunds, click here. Firstly, navigate to Settings > Car Rental > Online Charges as shown in the picture below highlighted in orange and dark blue. Here on this page, there are a few settings regarding the Security deposits that you can adjust. These settings are “Days in Advance to Charge the Security Deposit”, “Disabled Currencies for Security Deposit”, “Use Online Credit Card Security Deposits?”, and “Enable Automatic Charges on Security Deposits”. This setting allows you to charge the security deposit x days before the actual reservation begins. If you set this up you will still be able to also send Authorization requests. This setting allows you to disable the certain currencies that you support in the system as to not be able to be collected for security deposits. Use Online Credit Card Security Deposits? When enabled, this setting allows you to collect security deposits online when making a reservation. When enabled, this setting will automatically charge the security deposits for long term rentals. If you enable this, then you will still be able to send Authorization requests. Please note that if an Authorization payment request is made on step 6 the charge will be made on the existing credit card on file. If the transaction is completed, then a success email will be sent to the customer. If not, then the system will send a security deposit request email. 1.2 How to make a new reservation? 1.3 How to Cancel a Reservation? 1.4 How to Delete a Reservation? 1.16 How to add a discount or charge? 1.17 How to link pictures to reservation?